Last week I did a harder-than-usual “push” for subscription upgrades. You might like to know the excellent result: 32 upgrades. Just 32 upgrades is “excellent”?! Yep. The week before, it was four. The week before that was better: 15. Not very many people step up to make this publication run, which is why I keep saying the ones who do are the “cream of the crop.” If you can upgrade, you’ll be one of the few who really help (details here) — and, as always, if you truly can’t afford it, you’re absolutely welcome to stay on the free distribution as long as you’d like. There are other ways that help keep True running which don’t cost a thing, too. For some ideas please do see this page. Gee, thanks — how generous of her. While I’d love to be able to give up my profits for a second time this spring, I just can’t afford to. I have a payroll to meet, and a mortgage to pay, just like most business owners. Remember how Haiti was devastated by an earthquake in January 2010 (which is still being talked about)? It was a huge disaster — one that’s ongoing as people there are still struggling to get life back to normal. Well, the quake that hit Japan was a thousand times more powerful than that one. We humans can barely fathom the destructive power — especially from afar. Absolutely there are people really suffering along the Mississippi river. There are plenty suffering from last month’s tornados in and around Alabama, too. And… And… And! 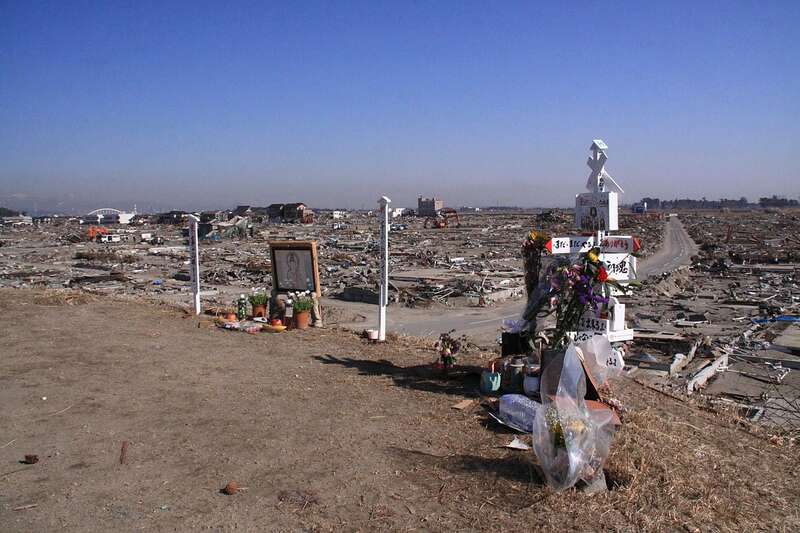 Knowing what hit Japan (not just their biggest earthquake on record, but also their biggest tsunami disaster ever, and also the biggest nuclear catastrophe in the history of the world), I decided to take action. I decided to do something about it. And a few hundred very cool True readers helped me do that. But then, why should I be surprised? True is about learning from the incredibly stupid things people say and do. Yet after 17 years I continue to think of True’s readers as The Smart Ones, the ones who want to be prompted to think! And I think I will always stubbornly cling to that belief, because most of you are that way! So yeah: I’ll be surprised over and over again, as long as I continue to do this. And roll my eyes at the obliviots every time…. Actually Randy, I’m with her – while it is your choice, I prefer my charity donations stay in this country. And I think I am less likely now given your little diatribe to upgrade any time soon. My response: Why do you think this is an “us vs them” situation? The woman I was quoting didn’t say so. She simply said “Hey, you helped once, why not give your profits up AGAIN?” To bring in Americanism is to take this to a whole new level. And if you’re not interested in hearing what I have to say, why the hell are you reading TRUE in the first place? Ms. Anonymous has inspired me to donate a premium subscription to someone who commented on your [site]. What’s the best way to handle that? And no worries — if someone else beats me to it, then give the upgrade to the person of your choice. Thanks Randy! And she did follow through. So I lost a cranky xenophobe, and gained someone thoughtful. Sounds like a great trade to me. OK, so I’ve been a free subscriber for about a bazillion years (or just short of that). Honestly, I’ve never been moved to upgrade, I’ve been satisfied with the number of stories in the free edition and I mostly ignore the ads. Nothing was wrong, so why fix it, and why pay for it? Then, the New York Times put up a pay wall. As they did so, I began to consider what sort of content and information would be most valuable to me. More than that, since much of the internet universe is such dreck, weakly produced, poorly written, and unthinking, and so precious little of it is thoughtful, well-written, and consummately produced: I wondered who amongst the minions should get paid for their work? The first of the very, very, few names that came to mind was yours. So here it is, my 192 bits, my contribution to your continuing efforts, with my gratitude for your work. I am not sure if I have ever thanked you for your publication. I cannot remember how long I have been a premium subscriber, but for the time that I have been I truly look forward to each week’s edition. I think the $24 a year would be well spent on just the Honorary Unsubscribe. It is both a history and humanities lesson. Thank you for your efforts all these years and please keep it coming. It is not a complete week without a This is True. Thanks! Finally it sank in. Hey, I AM capable of learning; it just takes a little time. So, for $24, I gave it a shot. And wished you’d told me about it sooner. Oh, you did tell me sooner. Well, I’m glad you kept telling me about it, ’cause I just assumed it was some schlocky little freebie newsletter. I was glad to find out it was a well-considered production worth every penny I spent. Let’s see, 10 stories a week, a headline of the week, honorary unsubscribe, right there is 65 items a month at a cost of $2. Not to mention the blog and interactive aspects. Yeah, people like me have to be reminded to check out what they’ve been missing. I am sorry that I am unable to subscribe to the full version. I am disabled and as such on a very limited income, but wanted to tell you that you are producing one of the most entertaining newspapers on the net. Thank You. If you can help, that’s good, and right. Unfortunately, we can’t help all the time, but every bit we can is better than just leaving people to suffer. Interesting blog. Believe it or not, This is True led to me making your blog one of my two homepages, and that was before I upgraded! Now that I get the “Rest of the story” I wonder what it’s like. I too still keep the free edition in order to send to family and friends who may not be as fortunate as I to subscribe to either True. Even just this past week, 6 days after you blogged and wrote about it in the premium true, my lovely wife told me of some (insert obliviot) that told the world of the impending doom happening….oh wait… 4 hours and 41 minutes ago. Missed his mark, eh? Perhaps he was just mistaken, as he was in 1996. And will be again in 2012, 2013, etc. Keep it up Randy. My upgrade was a present to myself, and I’ve not looked back since. I think most of her mindset is just prejudice. It is sad to hear that some people feel that someone is not deserving of help just because of their national origin. The woman who suggested you should donate to Mississippi River victims rather than Japan may simply want to encourage people to help Americans more than people on foreign soil. You seem to consider anyone who disagrees with you an idiot, or at least completely wrong. Many people are fed up with hunger and suffering in America while we package up crates of money to send out to other countries. Certainly the devastation in Japan and the suffering of those poor people demands a response, and it was very humane of you to do so, and by example, to encourage others to do so. Just instead of policing and fixing the entire world, it would be nice to consider our own people as well. I agree with Larry. It’s probably a criticism of who you did donate to, not a claim that you should repeat the gesture. I read the woman’s view as more along the lines of “I would divert some of the money I could spare to you if I agreed with what you would do with it.” That’s obnoxious on various levels, but not the same as trying to assuage her own guilt. Then again, there are all too many people out there who act as though making a living from writing (especially on the internet) is somehow immoral. Maybe she’s stupid enough to view paying you as a donation, and therefore feels guilty if she buys content (that she would benefit from) that supports you rather than going to charity. Also, you say that there was more than one message like hers. That really does worry me. I get the feeling from reading the negative responses to your Japan relief efforts that some thought that you made the decision to help Japan over Mississippi. If that’s the case, they obviously aren’t aware of the events’ time lines. Japan’s problems began well before the events in Mississippi and you had already committed to Japan. If that’s not the case, do some people really expect you to provide relief from your business for every tragedy? Ridiculous! For anyone to castigate you for where you send your donations is completely absurd and certainly none of their business. With that type of thinking, the gal in question may eventually end up as the main subject in one of your stories. I postponed my upgrade until after “Japan month”, so Randy would get his normal payment from a subscription (and, I have to admit, because I am a chronic procrastinator). I can donate as much as I like to Japan irrespective of what Randy is doing; I subscribe because I think the service True provides is reasonably priced and deserves to be financially supported by its users, not because of how Randy plans on spending the money I pay in subscription. To all those complaining out there: your contributions to a charity or cause are not limited to Randy’s philanthropy — you want money to go to Haiti or Japan, get a hold of a worthwhile aid organisation and hand over some of your hard earned. If you’re a little racist or insular and think that charity dollars should be spent at home first, well fine, send your cheque in aid of Mississippi or Missouri. But you have no right of complaint about where Randy chooses or does not choose to donate his income. I read not too long ago that our country is the most generous of any nation. People here help each other and all over the world. I would imagine that people give to multiple causes. Their is little justification in her actions. I cannot believe how truly selfish people can be when talking about charity. People have posted about being sad to see crates of food going overseas when we have hunger here. Firstly, we don’t know from hunger. There are places in the world where entire populations are starving. And why is a starving person in Africa or a homeless person in Japan LESS valuable or LESS important than an American. Japan is a democracy and shares the same values as a nation that we do. We don’t have a moral high ground to say that we are somehow more important or better. The disaster in Japan is likely to be a much larger one than the one in Mississippi, not necessarily in number of people affected (that can be hard to measure). But in damage to the countries ability to fix it. Events like Haiti aren’t the disasters that they are because they impoverish a few million people. They are TOTAL disasters because the country as a whole is decimated. (imagine a flooding Mississippi that wiped out every home east of the Rockies).